Among the tools the Federal Emergency Management Agency informally uses on the ground to monitor hurricanes is the status of Waffle Houses. The Georgia-based restaurant chain prides itself on having its 1,500 locations open 24/7, 365 days a year. That can because most of its outposts are in the South and the Gulf Coast and, thus, vulnerable to hurricanes, tropical storms and flooding. For precisely these reasons, it's also a reliable gauge of a storm's path of destruction. In other words, if it's closed, you probably don't want to be in the area. The "index" is the brainchild of former FEMA administrator Craig Fugate. He was unavailable for comment Thursday. 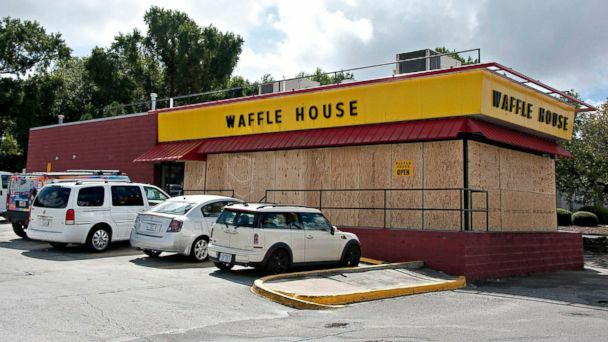 "If a Waffle House is closed because there's a disaster, it's bad," Fugate told NPR in 2016. "We call it red. If they're open but have a limited menu, that's yellow. If the Waffle House is open, everything's good." Waffle House CEO Walter Ehmer, who was in Myrtle Beach, South Carolina, spoke Thursday about the index on CNBC. "It sounded silly to us, too," he said, "but we're actually flattered they think about us in that regard." As for Thursday's Waffle House status: "We've got teams up and down the coast and in the evacuation markets," Ehmer said. "Most of our stores are still open. We're fortunate that none of our stores that are affected, which for us is over a couple hundred, none of them are right on the beach. Most of them are out of harm's way ... but only about a few of them are closed." The chain tweeted Tuesday that its storm center was activated for Florence. It was unclear exactly which locations in Florence's path were open. Waffle House did not immediately respond to a request for comment. The company does work closely with FEMA as part of the agency's partnerships with private companies. Ehmer wrote about his company's hurricane efforts in 2012. "We put our leadership on the ground right after the storm to make the decisions needed on where to send the supplies and manpower," he wrote in a post on the FEMA website. "Within hours of Hurricane Irene making landfall, our Chairman & CEO, two Executive Vice Presidents, a subsidiary President, our CFO and I were all on site managing the emergency from the front lines." He continued, "We had staged some supplies and sent additional manpower into the area. However it was the management on the ground making the decisions about what needed to go where - not someone back in our corporate office in Georgia. This allowed us to quickly respond to the issues at our restaurants." It's not surprising the diners are used as a model for forecasters, says Panos Kouvelis, director of the Boeing Center for Supply Chain Innovation at Washington University in St. Louis. He has studied Waffle House, Walmart, Home Depot and Loews and uses these companies as case studies of strong supply chain and risk management strategies, which make them particularly nimble when it comes to shifting operations in storms and disasters and then stay running, when customers need their products the most. "Right now Waffle House is probably studying which restaurants are going to be affected," Kouvelis told ABC News. "They try to pre-position supplies in storage somewhere relatively safe. Priority one is, 'Who are our people? How will this storm affect their lives?' Then you prepare how to move them. You may reserve hotel rooms so they can sleep near stores that are going to be open. "Why are they good at it? Because they've seen it many times in the past and they've learned from it and they have a really good playbook." FEMA cautioned reporters against taking the index too seriously. "Look, I think it was used at a point in time," FEMA's Alex Amparo told reporters on a phone briefing. "There is no official use for it. Our focus is on more empirical data." But a FEMA blog post from last September says: "If a Waffle House can serve a full menu, they've likely got power (or are running on a generator). A limited menu means an area may not have running water or electricity, but there's gas for the stove to make bacon, eggs, and coffee: exactly what hungry, weary people need."